I wasn’t sure what to make of Guardians of the Galaxy upon seeing the first trailers, but I knew I should give it a shot. Before seeing the movie, I caught up on seasons 2 thru 6 of Parks and Recreation, so I was ready to see Chris Pratt take on a Marvel role. The movie was quite impressive and I found myself loving it. 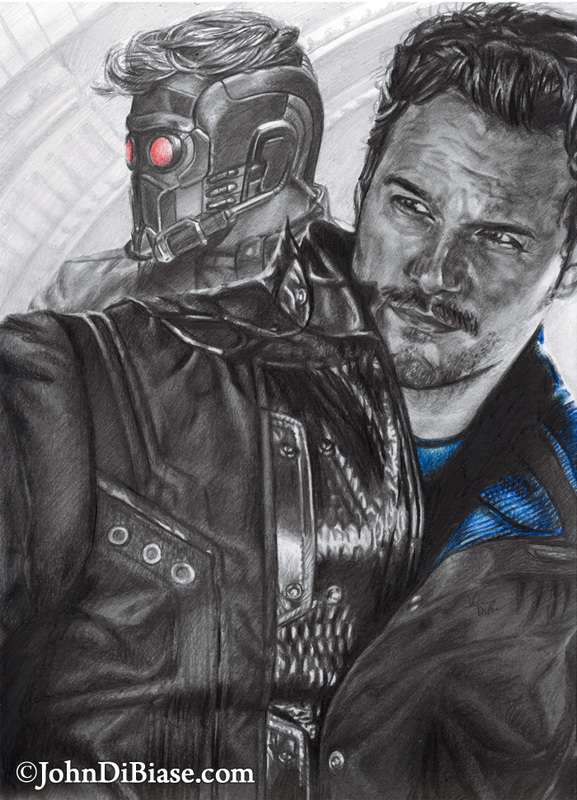 So, to fit with my previous Marvel drawings, I decided to add Star Lord to the mix. While working on it, I’d even drawn all of his color in graphite before deciding to erase it and add the splash of color like with my Avengers drawings. Near the end of finishing the portrait, I decided to fill the white space over his shoulder with his masked self, but slightly lighter than the foreground. Hopefully it turned out better.